Vinopanion | Blog | 5 Questions with Gavin Chanin of Chanin Wine Co.
WineLog » Blogs » Vinopanion » 5 Questions with Gavin Chanin of Chanin Wine Co.
1. Ward (Twitter)/Vinopanion – WineLog (Twitter): You have a bit more of an old school philosophy about your wines, despite making Pinot in California. Could you explain more about what you’re striving for with each vintage of your Chardonnay and Pinot Noir? Gavin Chanin (Twitter, WineLog): My wines are generally lower in alcohol and higher in acidity that what has recently been coming from California. I strive to make wines that have balance, energy, ageability and most importantly wines that are delicious. To do this in California I think you need to eliminate hot, alcoholic, fruity wines that show little about the place they were grown. I am fascinated with this idea that certain vineyards are so unique that they leave recognizable characteristics in the finished wines years and years down the road. In my experience, Pinot Noir and Chardonnay are most sensitive to changes in soil, and climate and thus a great place to explore the idea further. 2. Ward (Twitter)/Vinopanion – WineLog (Twitter): Despite your decidedly youthful age, you’ve thrown down some serious wine time, working vintages at such legends as Au Bon Climat, Qupé and a few others around the world. How did you get into wine so quickly and can I have your hookups (j/k)? Gavin Chanin (Twitter, WineLog): I worked my first harvest a few months after my high school graduation. I though winemaking really sounded cool so when to opportunity came up to make wine for a summer I jumped on it. I ended up falling in love with wine really quickly. I worked the next two vintages in California before taking a year off of school and working in south Africa and New Zealand. This will be my eighth vintage in California and my 11th harvest overall. 3. Ward (Twitter)/Vinopanion – WineLog (Twitter): Out of the vintages listed above, which one has been your favorite and why? Gavin Chanin (Twitter, WineLog): I really loved the 2010 vintage. It was a challenging vintage but at the same time I think I made my best wines yet. Doing you best work it what many consider a very tough vintage makes me even more proud of the wines. I love the elegance of the 2008s, the muscle of the 2009s and the balance of 2007. So I guess I like them all. I am a big believer that vintage is just as important as soil and climate when it comes to showing terroir so I love how every vintage is so different. 4. Ward (Twitter)/Vinopanion – WineLog (Twitter): Your degree out of UCLA was fine art. 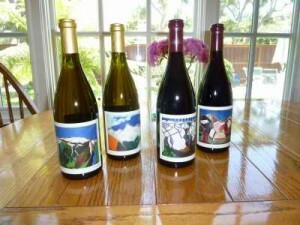 Indeed, you are actually quite an accomplished artist, winning awards for your artwork, which can be seen on each of your wine labels. Was it hard to decide between the two? Are you still actively painting? 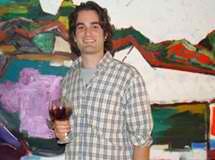 Gavin Chanin (Twitter, WineLog): I struggled between art and wine for a few years. Really art had no chance, I used to talk about wine all day in class anyways. I knew when I left school to work abroad that I would have to reapply to UCLA which at the time wasn’t accepting a lot of students. I took this risk because I loved wine and didn’t want to wait. I am still painting but I do it in quick productive bursts then take a few months off. I guess I am used to working harvest hours. 5. Ward (Twitter)/Vinopanion – WineLog (Twitter): You’ve worked in parts of California, New Zealand and South Africa. Was it hard to choose where you wanted to settle down once you made the decision to launch your own winery? Also, what’s next for Chanin Wines? 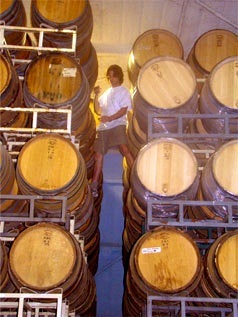 Gavin Chanin (Twitter, WineLog): There was never a question in my mind that I would make wine in Santa Barbara. This is such a unique area and I spent so much time training here. Maybe in the future I will have an opportunity to make wine from other regions in California, Sonoma has always been very appealing to me. I would love to make Syrah in South Africa. There is not a lot made out there and I think it could really be world class. As for Chanin Wine Co, I think in the future you will see more single vineyard wines from really unique places. On the flip side don’t rule out a Santa Barbara County Chardonnay and Pinot Noir. I think it would be a great way to introduce people to the more elegant side of California Pinot Noir and Chardonnay without them having to jump straight into the single vineyard wines. Listed below are the two wines that I had the fortune of tasting from Chanin, during that fine day in March for In Pursuit of Balance 2011. Below that are all of the wines that I tried at the event and am continuing to upload to my WineLog, tagged with “IPOB2011March“. 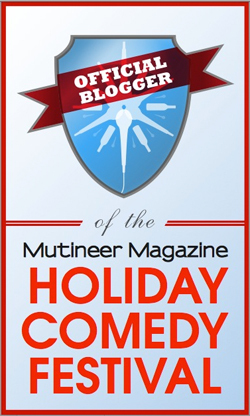 I also wanted to throw out a big thanks to Gavin for granting me the time for this interview. Cheers! Nose: Toast & earth, with baked yet juicy red fruit here, alongside some cola. Palate: Very juicy fruit here, very fresh and bright, and not anticipated from the nose. Good with the toast and fine tannins balances and light earth finish. Nose: Good tarter raspberry here, earthy toast and slight char, but also has some nice bright red fruit in the fore. Palate: Very bright acid here, light florals, earth and toast, good juiciest cranberry raspberry and finishes with touch of cola. 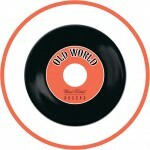 Very good: OldWorldWK.